Chilton Hosts Lake Wales HOA Seminar - Sharit, Bunn & Chilton, P.A. Sharit, Bunn & Chilton, P.A. 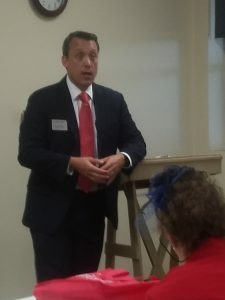 On March 30, 2018, Robert Chilton hosted a homeowners’ association law seminar at the Lake Wales Public Library. Directors and officers from multiple associations were present. At the seminar, a myriad of topics were addressed including estoppel fees and certificates, HOA budgets, reserves and financial reports, assessment collection and covenant enforcement. Mr. Chilton and the firm of Sharit, Bunn & Chilton, P.A. have been approved by Florida’s Department of Business and Professional Regulation as an HOA Board Member Certification Provider pursuant to Section 720.3033, Florida Homeowners’ Association Act.